If you enjoy Cabernet Sauvignon (or any of the 5 noble grapes of Bordeaux that also include Merlot, Cabernet Franc, Malbec and Petit Verdot) visiting Bordeaux may be on your bucket list, it certainly was on mine. 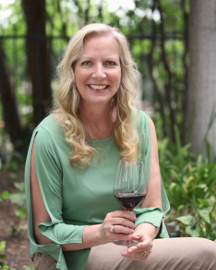 And, after my first day in Pomerol where Merlot is the predominant grape, I’m sitting in my hotel in Bordeaux city center sipping a glass of wine from one of the five wineries we (my husband Eddie is in many of my photographs) planned to visit on our trip. Visiting a Château is not something I wanted to rush so visiting only five over two days seemed just fine, and thanks to Planet Bordeaux and the helpful tourism office of Bordeaux, I was set with leisurely tours and tastings. Note: As I was walking or standing most of the time my notes are brief, but I think you will get the idea! 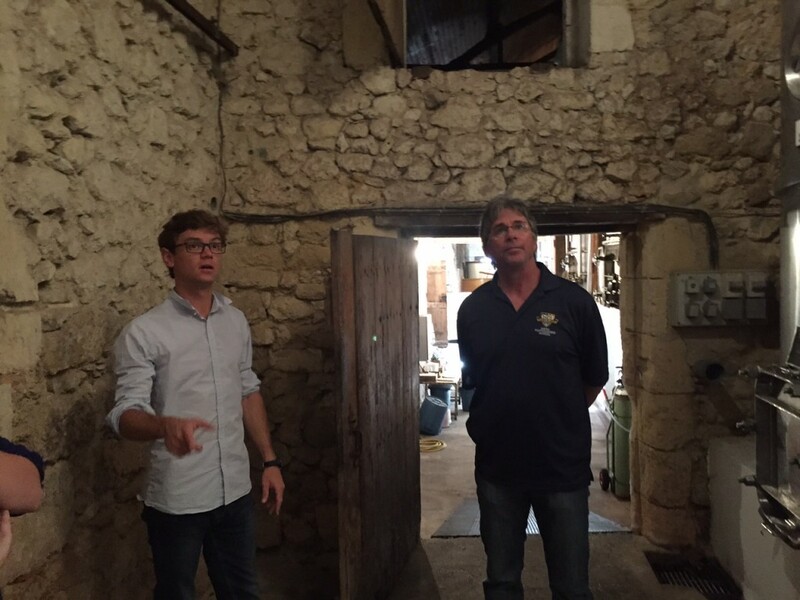 Winemaker/Export Manager Thomas Le Grix de la Salle showing the winery to Eddie Bushman. We learned that the property started out as a farm where cows made their home, and now is where vines reside. After World War II they decided it was a nice terroir for vines and the family began cultivating and selling grapes. 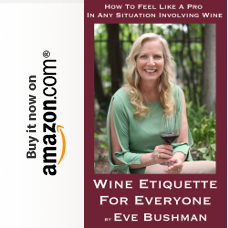 Negotiants – thought to be untrustworthy – were soon discarded by the winery, and they chose to sell their wines directly to the consumer. As a point of history they were the first to do this in Bordeaux. The vine production grew from its original of 40 hectares to 120 hectares. Windows of the Château were not installed in an effort to prevent bandits from entering. 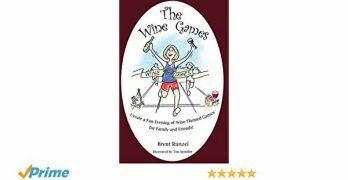 Grapes include Sauvignon Blanc, Semillon, Muscadet, Merlot, Cabernet Sauvignon and Cabernet Franc. The three-level cellar was built in 1970. The stainless steel tanks were originally designed to use for milk before then! Winemaker/Export Manager Thomas Le Grix de la Salle explained that you can’t make “good wine without clay…Latour, Petrus, all have clay” and both clay and limestone are needed for their sponge effect in holding water. Thomas studied agriculture in Toulouse, travelled to gain experience at Santa Barbara Winery and then in far off Marlborough, New Zealand; making Pinot Noir and Chardonnay in both locations. 95% of the grapes used in their wines are from their own estate. Due to global warming, a very real thing to Thomas, he is having great success with Cabernet Franc and is using more in his blends. This may be a trend to watch. 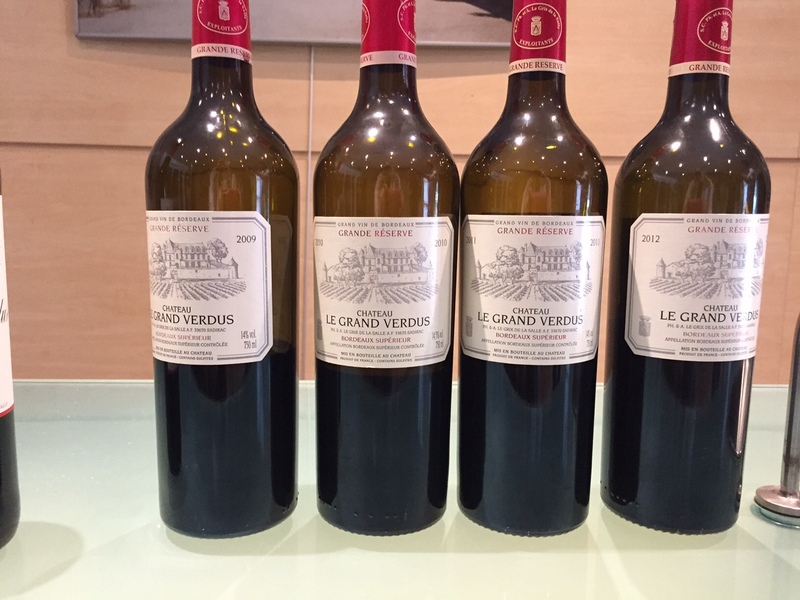 We tasted several whites, a rosé, a red vertical from 2009 to 2012 of their Grand Reserves, and a 2010 and 2011 from their second label “Generation” red blends. (The second label had different color capsules, making them easier to find for a buyer according to Thomas.) Most were predominant Merlot with Cab and/or Cab Franc. All with great balance, fruit, acidity and ageability. Across the board I’d have to give them all high marks, and nothing less than 90 Eve points. Our guide, Julie Bellot, explained that they only make red wines in this very modern looking facility. Most wineries are small and have 4 to 10 hectares. They produce Merlot, Cabernet Franc and Cabernet Sauvignon. 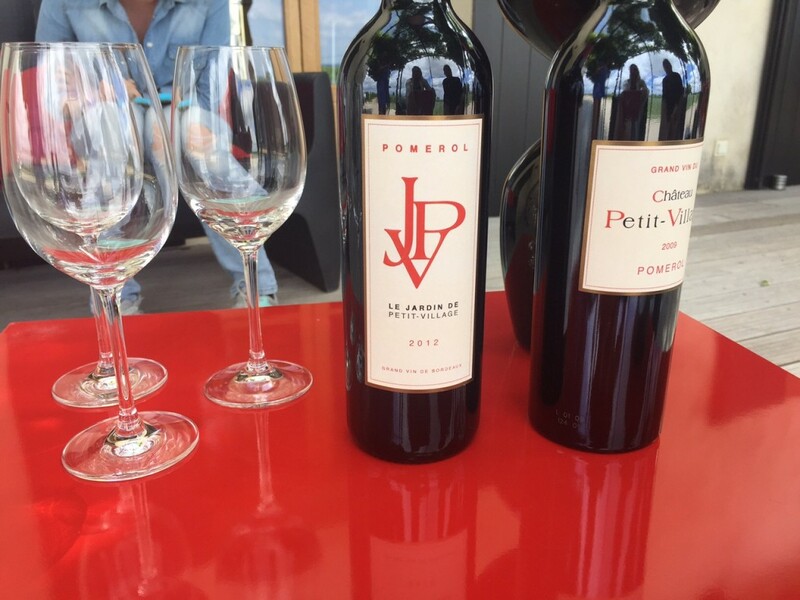 Julie said that they were one of the first Pomerol wineries to modernize. Many chocolate colored concrete tanks fill the winery – that was a first for me to see! They are lined with epoxy so no concrete flavor imparts to the wine. Petit Village benefits from both wind and humidity – the wind dries the leaves and the bunches. The Merlot benefits from the sand, gravel and clay in the soil. “Bad pollinates” result in uneven grape size in the bunches. Birds and small animals like foxes are not a problem. Cabernet Franc leaves are smaller than the other grape leaves. The older the vines the smaller the yield. They only make two labels, first and the second. The second label will not have the word “Château” on the label, is made from the youngest wines and will be a lesser cost. Wines of Pomerol have to have a majority of Merlot. We tasted a 2012 Merlot (second label) and the 2009 Merlot that had longer aging before its release. Both were enjoyable now, or you can age. “This is the best place in the world to grow Merlot,” Julie commented, there is “always that velvet sensation in (the) mouth (and there is) great quality of Pomerol wines.” Both of these wines deserved a minimum 90 Eve points.